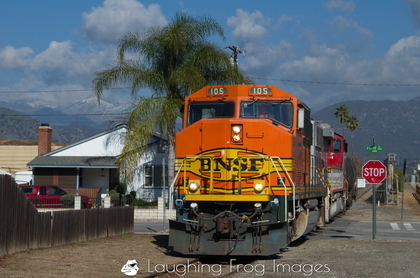 The BNSF Pasadena Sub Gallery has been added to Laughing Frog Images. The current Pasadena Sub is actually owned by Metrolink – the Los Angeles regional commuter rail system. The western half of the Pasadena Sub is now part of the Metro Gold Line, a light rail commuter line. Freight service from San Bernardino to the MillerCoors brewery in Irwindale is provided by BNSF. Back in The Day, the Pasadena Sub was a prime passenger route for the Santa Fe – all of the name trains that stopped at Pasadena passed over the subdivision. The Pasadena Sub local freight was handled by two to four GP-30/GP-35 units before they were largely retired. I though it was cool to be photographing some of this action with my 1.2 megapixel digital camera way back when that was the cat’s meow. And now… I want to smack myself upside the head, because the usable print size of those images is about 4″x6″ on a good day… I included a few images from the early days of digital to look at, if nothing else. I do have some slides to find and scan, but for the most part, my quality stuff of the Pasadena Sub doesn’t include the Blondes (Santa Fe’s blue and yellow version of the Warbonnet applied to locomotives in the latter part of the 20th century). 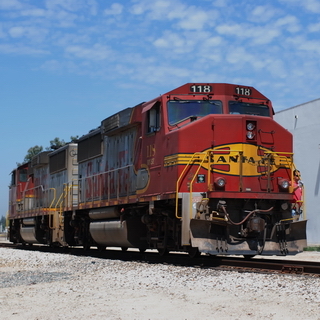 Of late, the power has been ex-Santa Fe GP-60Ms that were children of the reborn Super Fleet and delivered in the classic Warbonnet paint scheme in the early 1990’s. They were built for speed to handle priority intermodal traffic from Chicago to Los Angeles and Richmond. And now, most of them are serving out their time on local and regional freights on the former Santa Fe lines. Enjoy what I’m able to share with you of the BNSF Pasadena Sub! Westbound grain and glint. What’s that about? We’re between Fenner and Goffs, CA on the former Santa Fe Railroad, now commonly referred to as the BNSF Transcon. This is a westbound grain train moving downgrade from the summit at Goffs. 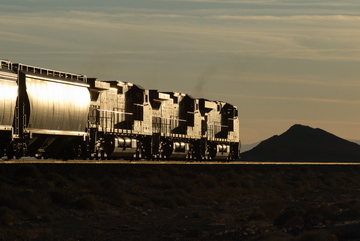 The train is heading towards the setting sun – and I’m shooting at roughly the opposite angle of the sun. That’s where the glint comes from. This is an untouched color image. Note how the colors have largely shifted to black, white, gray and muted pastels. Those of you familiar with the BNSF know that these locomotives are predominantly orange, and that the covered hopper cars are a red oxide color – but you’d never know that from this image! But the detail! Glint shots can bring out details that you wouldn’t ordinarily notice. You’re looking at the surfaces that reflect light in an entirely different way. What isn’t reflecting light simply shows as black. And it’s different. And interesting. And not your typical image. It’s not your typical train picture. And that’s what makes in interesting. 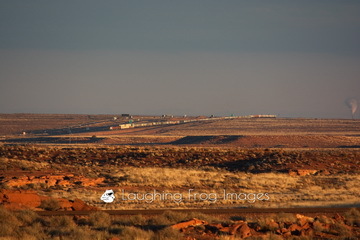 You can find the image here at Laughing Frog Images. If Black and White is something that interests you, you can get it in B&W with the click of a mouse.